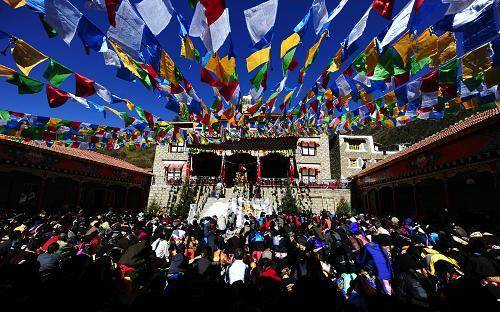 It is the Consecration Day for Gebang Megdo Monastery in Maerkang County of Aba Tibetan and Qiang Autonomous Prefecture, southwest China's Sichuan Province, Oct. 30. Maerkang, capital city of Aba Tibetan and Qiang Autonomous Prefecture, southwest China's Sichuan Province, is the birthplace of Jiarong Tibetans with traditional Tibetan dwellings, historical bunkers, grand monasteries, mysterious ruins of ancient kingdoms and holy mountains. With picturesque natural scenery and ethnic features, Maerkang has attracted a large number of domestic and foreign tourists in its best tourist season of the year.